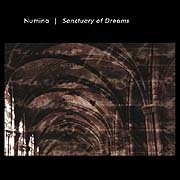 Sanctuary of Dreams (73'14") by Numina (a.k.a. Jesse Sola) comes from the same spark as many other soundworld realizations in the field of Spacemusic. Through the subtle manipulation of deep drones, sub-sonic swells, metallic sonorities and the slow spiraling of contrasting chords, Numina provides the listener with a wondrous sonic sanctuary in which to reflect upon their own inner workings. Throughout his music we find an artist trying to identify his relationship with the scale of his work, and the relationship of this work to the environment. The material on Sanctuary of Dreams guides the form in which Numina is working. The 10 tracks are each a storm of color and sound, less representative of the chaos of the unconscious mind than of the enigmatic and ominous world of dreams . . . visions beyond cognition.